With a sharp knife, make a few incisions on both sides of the fish, 1/4 in. deep so sauce can penetrate. Season with salt and pepper. Brown both sides (about 15 minutes), drain and set aside. Wait for the oil to heat up, then fry the fish again. Transfer vegetables to a hot platter. Place fish on top. Transfer sauce to the wok. Stir gently at high heat and bring to a boil. Continue cooking at medium-high heat, stirring mixture until sauce has thickened. 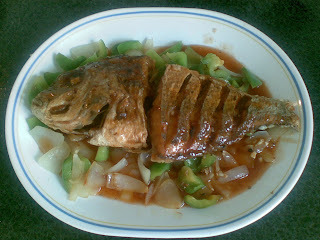 Pour mixture over fish and serve immediately with steamed rice. Serves 3 or 4.